Healthy Harbor is now offering EcoTours of green infrastructure projects along Baltimore’s Inner Harbor promenade. EcoTours are casual walking tours of Healthy Harbor’s green infrastructure projects along the promenade. They are for all ages, can be altered to fit your interests and needs, and provide an inside look at what positive urban green projects exist along the Inner Harbor. The Waterfront Partnership’s Healthy Harbor Initiative works to restore and protect our City’s most valuable asset – the Baltimore Harbor. The health of the Harbor is suffering from sewage pollution, trash pollution, stormwater runoff, sparse remaining living shoreline, and most importantly widespread indifference from the Baltimore Community. 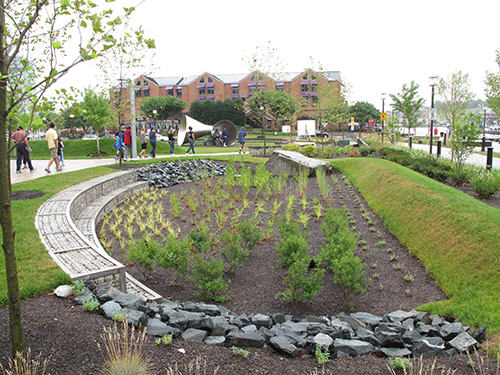 In order to help alleviate these issues and engage the public on urban environmental solutions, Healthy Harbor has installed and managed various green infrastructure projects along the Inner Harbor’s promenade. The projects include floating wetlands, oyster gardening, Pierce’s Park rain gardens, and Mr. Trash Wheel. What is the cost of an EcoTour? The tour begins at the floating wetlands by the World Trade Center of Baltimore. How long does the tour usually last? The tour lasts 1 hour. It can be tailored to how much time the group has. Are there bathroom facilities available nearby? There is a public restroom on the outside of the National Aquarium. The tour is for people of all ages. Do you have a minimum / maximum number of participants for your tour? A minimum of 5 and a maximum of 35. We can potentially make arrangements for larger groups. 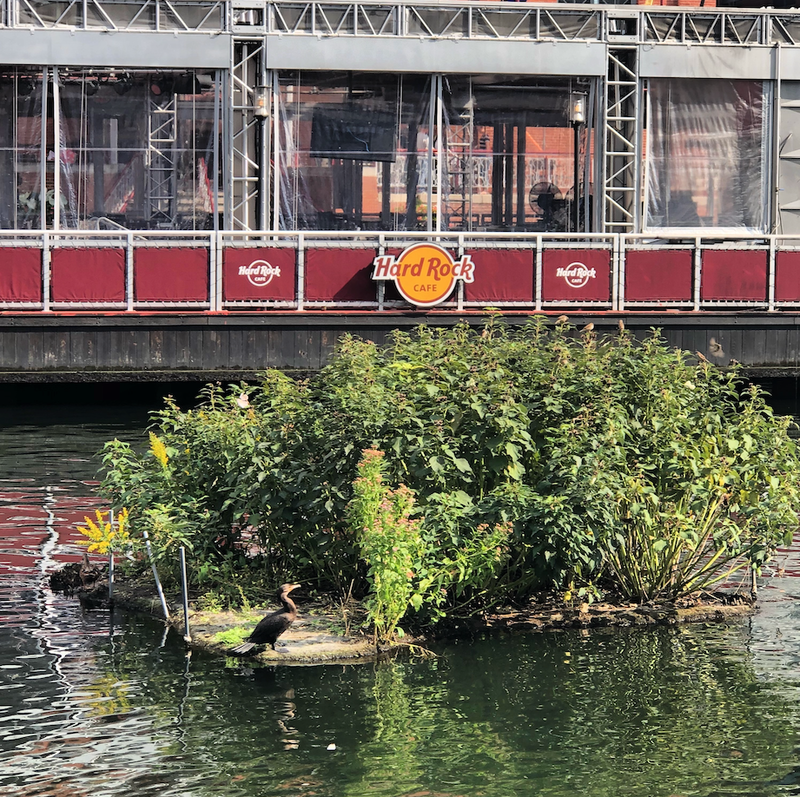 The National Aquarium has installed two floating wetlands planted with native species that provide a habitat for marine life and help to clean the water. Every time it rains, pollutants from lawns, roads, and other urban surfaces are swept into our streams and harbor. Fortunately, we’re able to battle this runoff with the Floating Wetlands, an efficient tool for cleaning polluted water. As the plants of the wetlands grow, they remove nutrient pollution and store it in their leaves while adding life-giving oxygen to the water. At the same time, their roots provide a home for microorganisms that feed on pollution. The only element needed for all this to work? Simple sunlight. Baltimore has gone from being the oyster canning capital of the world in the 1800s to having an oyster population of just 1% of historic levels. At their peak, there were enough oysters to filter all of the Chesapeake Bay every 3 days. 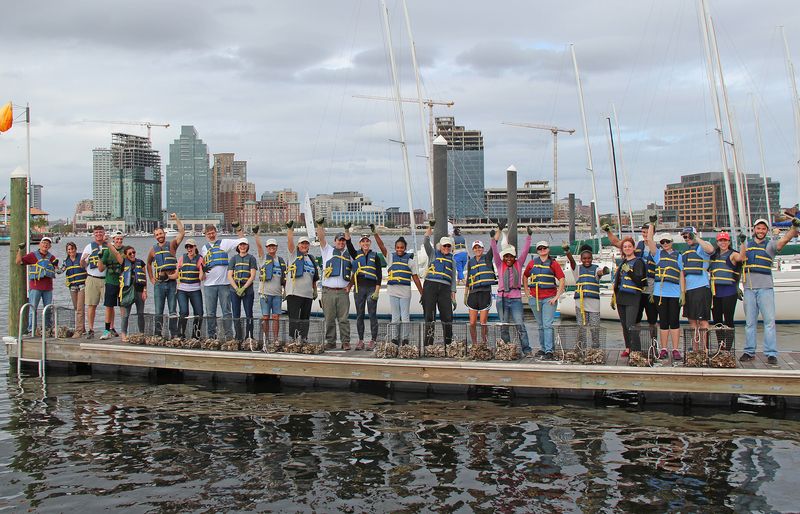 Today, volunteers who are part of the Great Baltimore Oyster Partnership grow Eastern Oyster spat-on-shell in cages around the Inner Harbor. The cages provide a safe space for the spat to grow – protected from predators and near the surface. After nine months of growth, the mature oysters are transported to a protected sanctuary near Fort Carroll in the tidal Patapsco River where they live out their lives. Pierce’s Park is a free public park located adjacent to the Columbus Center in the heart of the Inner Harbor. The park features two native rain gardens, a bio-retention rain garden, original sculptures, a musical fence, and a living willow tunnel. Rain gardens help reduce storm water runoff by slowing down the flow of water through absorption and naturally filtering it through the soil. Native plants are significant because they are adapted to the local climate and soil conditions where they naturally occur. Native plant species provide nectar, pollen, and seeds that serve as food for native butterflies, insects, birds and other fauna. The native rain gardens feature Echinacea, Black Eyed Susan’s and native grasses such as Purple Love Grass that all provide habitat for swallowtails, bees, and larvae. The Inner Harbor Water Wheel, or “Mr. 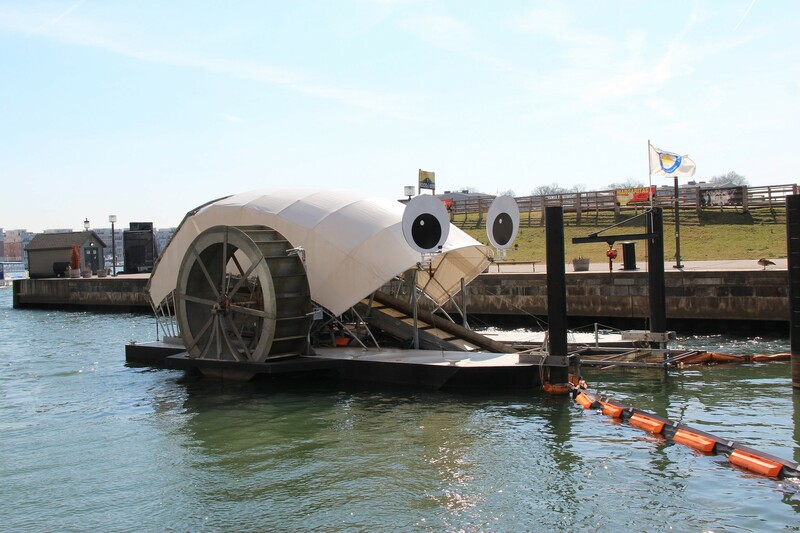 Trash Wheel”, uses solar panels and the current of the Jones Falls River to collect litter and debris entering the Inner Harbor. The river’s current provides power to turn the water wheel, which lifts trash and debris from the water and deposits it into a dumpster barge. When there isn’t an adequate enough current, a solar panel array provides additional power to keep the machine running. When the dumpster is full, it is towed away by boat, brought to an incinerator, and a new dumpster is put in place. The trash and debris collected by the Water Wheel is counted and recorded into five categories: plastic bottles, polystyrene containers, cigarette butts, glass bottles, grocery bags, chip bags, and the dumpster’s overall weight. This information is available for public viewing on MrTrashWheel.com.